A Day at Brigadoon - BRIGADOON | Bundanoon Highland Gathering Inc.
After the mists have risen at dawn, the town of Bundanoon becomes Brigadoon for a day (even the name on the station changes to Brigadoon!) The main street is closed and there is a bustle of activity as people prepare for the big parade. 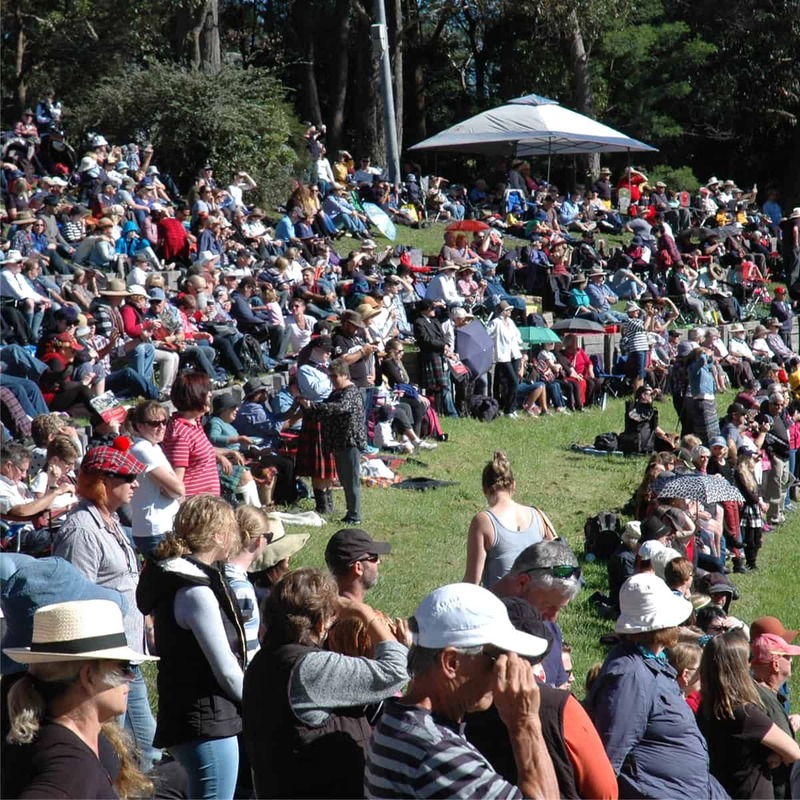 Visitors from all over Australia are making their way to Brigadoon (over 10,000 of them). The Parade begins at 9.00 a.m. Thousands line the streets as hundreds of pipes and drums (over 20 bands in all), colourful floats and displays, marchers, vintage cars, and service and community vehicles make their way to the grounds for the games. Tickets are available at the gates – the profits from their sale contributing too many worthwhile charities and community causes in the Bundanoon area. Free car parking is available adjacent to the grounds (take the western road over “Brigadoon Bridge” along the railway line as you approach from Moss Vale, the bridge near the Pill Factory if approaching from Penrose. After the bands have arrived, the first of the massed band displays for the day takes place. Up to 500 pipers and drummers regularly perform every year at Brigadoon. With carefully maneuvered patterns of marchers, the flourishes of the drum majors, and the heavenly sound of the pipes receding, advancing, and reverberating around the glen, you don’t need to be Scottish to feel the thrill of the occasion. At 10.00 a.m., the Official Opening ceremony takes place, and the Chieftain of the Day is introduced. The Chieftain of the Day is usually an eminent clan leader from Australia, or Scotland, or elsewhere in the world. Always an imposing figure, he (or she) welcomes visitors to the gathering and presides over the day. After the flag raising ceremony and national anthems the games begin. Rob Langley will sing the Australian National Anthem, Advance Australia Fair. The next event of the day is a massed demonstration of Scottish Country Dancing. Country Dancing is a group activity, performed by sets of 2, 3, 4 or more couples. Consisting of strathspeys and reels, the steps are simple to learn and leisurely in tempo, the fun being in the designs woven by the dance. If you’ve never attempted Scottish Country Dancing before, this is your chance as the display ends in the “Dashing White Sergeant” and the audience is invited to join in! Part of the fun of the day comes from watching, or preferably participating in, the various Highland Games and other activities. All participants are welcome – from wee bairns to the older lads and lassies. For the bairns there is the Bonnie Bairns Highland Dress Competition – prizes for the best kilt, dress, trews – or any baby or toddler wearing something otherwise vaguely Scots! For those wishing to get back to nature, there is the Hay Toss – where you stand back to a type of ‘high jump’ bar with a bale of hay on the end of a pitchfork, and attempt to throw it as far over the bar as you can! If you get tired of sitting and watching, you might join in the Kilted Dash – a running race for males and females in Open, High School or Primary School categories: you don’t need to wear a kilt, but you must wear something tartan! And for sheer fun, join in the Egg Throwing Competition, or the Water Toss – where partners take it in turns to throw raw eggs or water-filled balloons at each other, those throwing the furthest distance before they break being the winners. Wee Heavy Weight. This event is for Preschool age participants. Participants can try their luck at tossing the caber and throwing Fergie pins. Participants in these two events will go into a draw for a prize at Mittagong Tenpin Bowling. And for the wee folk in training for the Stones of Manhood, there is the Fergie Stones where the young ones have to race to lift different sized medicine balls onto barrels, just like the real thing! Almost all games have categories for adults and juniors alike. Everyone is invited to join in, but if you aren’t feeling energetic on the day there is plenty of fun to be had watching. Heaps More to See & Do! There are enough activities to keep you busy and entertained at Brigadoon throughout the day, including the solo fiddler, kennel club, Highland Cattle displays choirs and other performers. You could spend some time watching the bands and drum majors practicing, highland dances, take in the colourful tartan dress of the crowds, or visit the many stalls in the Clan Area where you can find displays and information about the many Highland clans and septs, or trace your Scots heritage. New Area: The committee have redeveloped an area to the rear of the oval into an Entertainment area. Bundanoon Public School Choir: The Choir is a recent initiative for the school, allowing students from years 2 to 6 the opportunity to experience the joy of singing with a group of friends whilst learning musicality in a team setting. We are lucky to have the talented Danielle Hewitt (Bundanoon Sings) and Hannah Halloran to lead the group as choirmasters and mentors. Students meet once a week to make beautiful music and enjoy each other’s company in a setting of experiential learning. Performance opportunities throughout the year provide additional authentic purpose for our burgeoning singers. The area will have covered seating with several food and drink stalls available to allow members of the public an area where to sit back and relax to the music and enjoy a meal. Hungry? There are dozens of Food Stalls serving food including Devonshire teas and coffee, barbecue sausages and steaks, hot potatoes, pancakes, snacks, cakes, ice creams, and drinks. Don’t miss out on the Highland delicacies such as Scots pies, haggis, blood pudding, square sausage, and the famous Scottish Shortbread. Plus other interesting food stalls give the day a multicultural flavour. There are lots of other stalls with Caledonian souvenirs and goods, jams and preserves, clothing, arts and crafts, and information tents. The grounds are well served on the day with seats overlooking the arena, places to picnic – with tables and chairs, and toilet facilities. There is a licensed club adjacent for adults, and if it is a cool Highland day you might want to start with a wee dram! Throughout the day in the main arena there are pipe band displays at 3 locations around the oval. Up to 600 pipers and drummers typically attend Brigadoon, and although bands do not compete against each other, the pipe band display offers them the opportunity to engage in some virtuoso performances of their favourite marches, lilts and airs. The pipe bands at Brigadoon are of the highest standard, and for the lover of the bagpipe, there can be no better way to spend a day than in the company of some of the best pipers and drummers in Australia – at Brigadoon. Brigadoon is proud to say that they are reintroducing the Brigadoon Challenge,. One of the highlights of the day is the Lifting of the Bundanoon Stones of Manhood. This extraordinary feat of strength was started some years ago and consists in lifting a series of sandstone balls weighing a total of hundreds of kilos, and placing them on a row of barrels spaced out across the field. The stones, of different sizes (up to 165 kilograms), were carved at the Bundanoon Sandstone Quarries. When first introduced, the competition was contested by strongmen from around the world. The strongest men, however, were Australian born – and the famous group of Tartan Warriors appears each year to show their skills. The sun has lowered in the western sky, the clock moves towards 4.00 p.m., and our day at Brigadoon is drawing to a close. In the final ceremonies the pipes and drums reappear for the Final Massed Bands Display and inspection by the Chieftain of the Day. After the official Closing Ceremony the crowd falls silent for the Lone Piper. Another year – another day at Brigadoon – has come to an end, and the crowd leaves in the gloaming with full hearts and their ears still ringing with the haunting sounds of the bagpipe. In the evening visitors to Brigadoon and participants gather at the local hall for the Ceilidh – a traditional Highlands knees-up where the haggis holds pride of place. And then the mist descends, and the mythical village of Brigadoon falls under a spell, to sleep again until next year. The recreational activity you are about to engage in or view as a spectator may cause you physical harm. other kinds of accidents including things done or left undone negligently in the management of this activity.